Most flocks of egg laying hens go through the same typical production curve. The flock quickly peaks in egg production and then slowly reduces its level of egg production. It is important to remember, however, that not all the hens in a flock will be laying at the same rate. Some hens may never lay a single egg while others may go out of production earlier than the majority of the flock. Economically it would be helpful to find such hens and remove them from the flock. To do so requires an ability to assess the persistency and intensity of lay for each hen. Persistency of lay refers to the number of eggs laid over a specific period of time. Intensity of lay refers to the current level of egg production. With yellow-skinned hens, such as leghorns, loss of pigment from their skin is an important characteristic for determining the persistency of lay. As a pullet grows, yellow pigment is de-posited in the skin, beak, shanks and feet.Once the pullet starts laying eggs, the pigmentis then removed from the pigmented areas toprovide the yellow color in egg yolks. The pigment is removed from the differentparts of the body in a definite order – from thevent, eye ring, ear lobe, beak (corner of themouth toward the tip), bottom of the foot, theshank (front, back and sides) and finally thehock and top of toes (see Figure 2 for the partsof the hen). Once a hen stops laying eggs, pigment is re-gained to the skin in the same order in which itwas bleach. It is NOT regained in the reverse order. As previously indicated, the first place to loose pigment is the vent. A hen that has been producing eggs will have very little yellow remaining in the skin around the vent. The intensity of yellow pigment decreases in the shanks and tops of toes of hens as the number of eggs produced increases. The feet of the hen on the left still has a lot of yellow pigment remaining in its shanks,feet and tops of toes indicating that she has laid less eggs than the other two hens. Most of the yellow has been bleached from the feet of the hen on the far right, indicating that she has laid the most eggs of the three hens and is thus the more persistent layer of the three. If you are comparing two hens of equal pigmentation the next factor to consider is‘handling qualities.’ Handling qualities are also the main factor to consider when comparing hens from breeds that do not have yellow skin so that the level of pigmentation cannot be used as an indicator of egg production. ‘Handling qualities’ refer to the amount of fat in the abdominal area. Unlike cattle which place their excess dietary energy as fat between muscle fibers producing the marbling effect of beef, poultry species deposit fat under the skin and in the abdominal area in what is referred to as the fat pad. You do not see a marbling effect in poultry meat. That is why poultry meat is so much leaner than beef,especially if you remove the skin with its underling fat. A hen uses the energy in the feed she eats to produce eggs. If she is not laying eggs, she does not require as much energy and much of the energy from the feed she eats is deposited as fat. The amount of fat in the abdomen,therefore, is a good indicator of a hen’s current level of production, known as the intensity of lay. To evaluate handling qualities, you need to know where the pubic bones and keel are located in the abdominal area of the hen. Take a pinch of skin just below the pubic bones and roll it gently between the thumb and finger to evaluate its thickness. If a hen is in production her dietary energy is being used for egg production and she will not have much fat in the abdomen. If a hen is not laying, the energy she is eating is not being used for egg production so it is deposited in the fat pad in the abdominal area. A hen which is in production will have a thinner pinch of skin in the abdominal area than one not laying. Note: When handling the hens be especially careful with the pubic bones, which can break easily if handled too roughly.Another important factor in evaluating laying intensity of hens is ‘abdominal capacity.’ The larger the abdominal capacity the better the current level of production. To evaluate abdominal capacity, place as many fingers as you can between the bottom of the pubic bones and the tip of the keel.Count the number of fingers you can get be-tween these two locations. This is the depth of the abdomen. Place as many fingers as you can between the two pubic bones. Count the number of fingers you can get between these two bones. This is the width of the abdomen.The abdominal capacity is then described as width by depth. 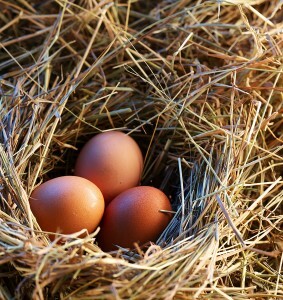 Molt is another factor that can be used to evaluate the level of egg production for individuals in a flock. The short feather in the middle of the wing is known as the axial feather.The 10 feathers outside of the axial feather are the primary feathers. To evaluate the status of a molt (including whether or not it is in a molt) it is these 10 primary feathers that are examined. Hens in a molt lose their primary feathers, starting with the feather closest to the axial feather and move outwards. Old feathers that have not molted will be worn on the ends and may be dirty and/or broken. New feathers are typically smooth and clean. Typically when a hen is in molt she goes ‘out of production’ (i.e., stops laying eggs) but some hens will continue to lay while molting,but usually at a reduced rate. Economically it is important to remove the unproductive hens from a flock. For those breeds with yellow skin color, level of pigmentation is a good tool for evaluating the level of production of each hen. Yellow-skinned breeds include most of those typically kept for egg production – Leghorn, Plymouth Rock, Rhode Island Reds and New Hampshires. The Australorp, an egg laying breed used in Australia, are not yellow-skinned. Their skin is black, though the bottoms of the feet and toes are pinkish white. For those hens that do not have yellow skin, the level of production of the hens can be evaluated using handling qualities (level of fat in the abdomen), abdominal capacity, and molt. Copyright 2011 for materials developed by University of Kentucky Cooperative Extension. This publication may be reproduced in portions or its entirety for educational and nonprofit purposes only. Permitted users shall give credit to the author(s) and include this copyright notice. Publications are also available on the World Wide Web at www.ca.uky.edu.